Astronomers working with the United Kingdom Infrared Telescope on Hawaii have discovered four pairs of stars that orbit each other in less than 4 hours. Until now it was thought that such close-in binary stars could not exist. About half of the stars in our Milky Way galaxy are, unlike our Sun, part of a binary system in which two stars orbit each other. Most likely, the stars in these systems were formed close together and have been in orbit around each other from birth onwards. It was always thought that if binary stars form too close to each other, they would quickly merge into one single, bigger star. This was in line with many observations taken over the last three decades showing the abundant population of stellar binaries, but none with orbital periods shorter than 5 hours. 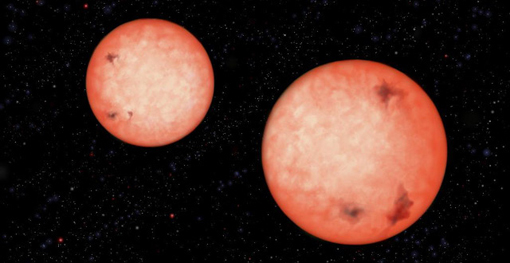 For the first time, the team has investigated binaries of red dwarfs, stars up to ten times smaller and a thousand times less luminous than the Sun. Although they form the most common type of star in the Milky Way, red dwarfs do not show up in normal surveys because of their dimness in visible light. Since stars shrink in size early in their lifetime, the fact that these very tight binaries exist means that their orbits must also have shrunk as well since their birth, otherwise the stars would have been in contact early on and have merged. However, it is not at all clear how these orbits could have shrunk by so much. One possible answer to this riddle is that cool stars in binary systems are much more active and violent than previously thought. It is possible that the magnetic field lines radiating out from the cool star companions get twisted and deformed as they spiral in towards each other, generating the extra activity through stellar wind, explosive flaring and star spots. Powerful magnetic activity could apply the brakes to these spinning stars, slowing them down so that they move closer together.